To What Extent Does Your State Rely on Individual Income Taxes? The individual income tax is one of the main sources of revenue for states, comprising 23.5 percent of total U.S. state and local tax collections in fiscal year 2015, the latest year of data available. The individual income tax ties with the general sales tax as the second largest source of state and local tax revenue after the property tax (See Facts and Figures Table 8). 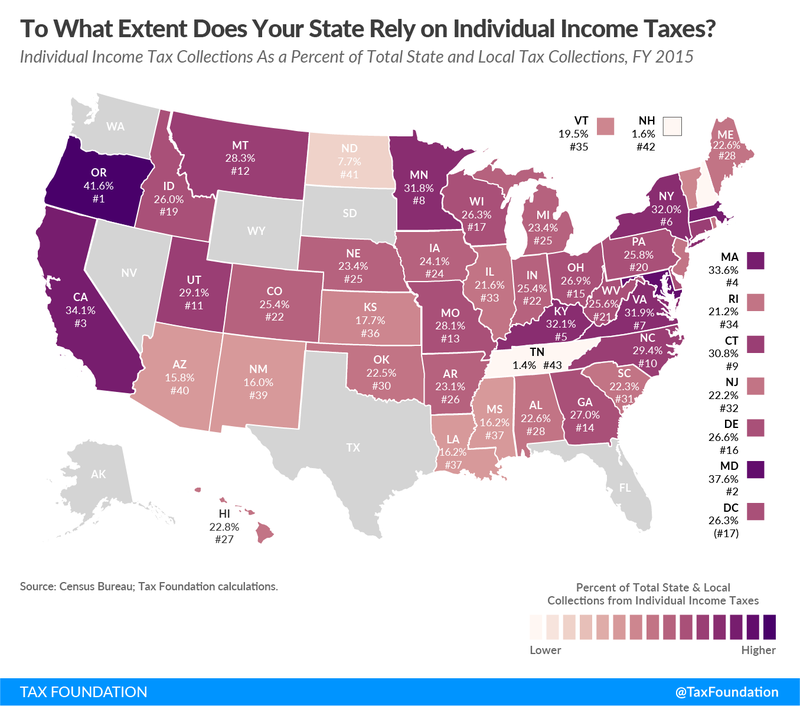 Today’s map shows the percentage of each state’s state and local tax collections attributable to the individual income tax. Oregon and Maryland are the states that rely most heavily on individual income taxes, generating 41.6 percent and 37.6 percent of their total state and local tax collections from the individual income tax, respectively. Both Oregon and Maryland are among the seventeen states where localities also levy income taxes. Oregon has chosen not to collect sales taxes, which contributes to that state’s heavy reliance on the individual income tax. While the individual income tax is a major revenue source for state and local governments as a whole, some states rely on it very little or not at all. Seven states (Alaska, Florida, Nevada, South Dakota, Texas, Washington, and Wyoming) do not collect individual income taxes, while two states (New Hampshire and Tennessee) collect taxes on dividend and interest income but not wage income. 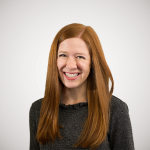 Tennessee’s tax on investment income–known as the “Hall tax”–is in the process of being phased out and will be fully repealed by 2021, which will leave the state with no individual income tax. Similarly, in New Hampshire, the Senate passed a bill to phase out the state’s tax on investment income, but that legislation did not receive consideration in the House during the 2018 legislative session. With no taxes on wage income, it is unsurprising that Tennessee and New Hampshire are the states that rely least heavily on the individual income tax, followed by North Dakota and Arizona, which generate 7.7 percent and 15.8 percent of their total tax collections from the individual income tax, respectively. As we’ve pointed out previously, a state’s mix of tax sources carries implications for revenue stability and economic growth. Income taxes tend to be more harmful to economic growth than consumption taxes and property taxes. Income taxes affect labor participation, saving, and investment, while consumption taxes, such as sales taxes, tax what people spend as opposed to what they earn. For instance, under the system in place in most states, if you earn money from wages and invest it, those wages will effectively be taxed twice—once when you collect the wages, and again when your investment yields a profit. Consumption taxes, on the other hand, are more neutral, and only tax what you spend money on, therefore only taxing wages once. Further, since many households see their personal income change with the business cycle, the individual income tax tends to generate a less stable source of revenue than other forms of taxation. Note: This is the first in a four-part map series in which we will examine the primary sources of state and local tax collections. To What Extent Does Your State Rely on Property Taxes? To What Extent Does Your State Rely on Corporate Income Taxes?